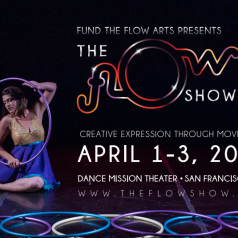 The Flow Show returns to Dance Mission Theater for it’s 8th year in the heart of San Francisco’s vibrant mission district. The Flow Show serves up a whopping cast of new and professional artists that all use Flow Arts as their medium to connect with performance and art. These acts are not your typical circus style routines. The performers specialize in Flow Arts, a broad manipulation category that can include everything from juggling to spinning poi, fans or hula hoops to levitating dancing wands. These skills are fused with dance, creative movement, and emotion to create a unique show that will inspire and captivate the imagination. Sold out seats year after year prove that audiences want to experience the new culture of Flow Arts.